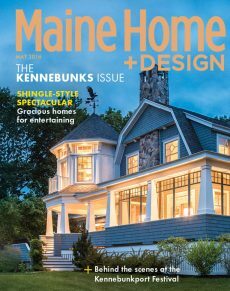 Formal meets functional in a Kennebunkport home designed for graciously entertaining family and friends. “We wanted a house that was substantial,” says Lord. “That felt like it was always there.” He achieved this with three massive granite chimneys, classic shingle- style features (bay dormers, oval windows, cedar shingles, and a sweeping porch) and an ell that attaches to a carriage house/ garage with a finished second floor. Still, the exterior design manages to minimize the home’s scale. The lines of the façade’s gambrel roof draw the eye downward, and on the ocean side, a one-story white screened-in porch with a roof deck also directs the view back to the land. Inside, the elaborate coffered ceilings, paneling, trim, moulding, chair rails, columns, and door pediments suggest a Georgian sensibility, but the formality of the architectural elements is played down, Catalfano says, with relaxed furnishings and finishes. The design was guided in part by the desire to maximize the views and to outfit the house for entertaining. The ground floor is open-concept, insofar as the living room, dining room, and kitchen are one rectangular room, but the spaces are defined by architectural elements like columns, beams, and half-walls. Double-hung windows with traditional grillwork go down to the floor, allowing for views of the open ocean. Seals sun on Bumpkin Island, which takes center stage if one is in the living room. Each room offers a different angle on the view, which extends dramatically to the north and south. The homeowners love to have family and friends visit, in groups large and small. To accommodate overnight guests, the house has four en suite bedrooms on the second floor. A bunkroom—lined floor to ceiling with nickel-gap board and built underneath a steeply sloped roofline—has two children’s built-in beds, which can be tucked against the wall or slid away on runners to allow for more headroom. In a downstairs library with a TV and fireplace, known as the “quiet room,” paneled walls are a distressed black with a red ochre undercoating. Furnishings include chinoiserie (like curtains with pagoda designs) and a white couch with red piping and a red seat cushion. With its own powder room, the library can house overflow guests, as can the entertainment room that abuts the bunkroom in the cupola-topped carriage house. Guests, of course, are not always overnight visitors, especially if you are the sort of person who likes to throw a party. And the homeowners like to throw a party: an outdoor gathering under a tent, a dinner in their dining room, even a fete in their heated garage. To accommodate all this, the house has two kitchens: an upstairs one for everyday use and a downstairs cook’s kitchen with an oversized refrigerator. For parties, meals can be prepared out of sight and then brought upstairs via an elevator. (The elevator will also facilitate aging in place.) The upstairs kitchen is refined, with a Jet Mist leathered granite countertop, two-inch Carrara marble on the center island, and custom inset cabinetry, the latter provided by kitchen designer Lindsay Farnsworth of Crown Point Cabinetry in Claremont, New Hampshire. The shop also provided cabinetry for the dish and food pantries, second kitchen, office, two laundry rooms, select bathrooms, and a wine closet. The latter is a cooling and humidity- controlled room built of fir, with floor-to-ceiling wine racks. The downstairs kitchen is part of a floor that is “Americana nautical,” as Catalfano describes it, and includes a red carpet with white stars, blue chair cushions with anchor fabric, sailboat photographs with red frames, sconces with map- patterned lampshades, red and blue bar stools, and, most striking, a mahogany and maple–topped bar in the shape of a boat. “I always wanted a Hinckley yacht, and Anthony said he was going to give it to me without the maintenance,” jokes the husband. The bar’s shape was a spur-of-the-moment idea by Catalfano that carpenter Lenny Hoseit of Thomas and Lord quickly drew up on-site. The owners’ bedroom is seafoam colored with a vaulted ceiling, a balcony, built-in cabinetry, and a fireplace with a Jet Mist leathered granite surround. “The suite has a grand view,” says Beaudette, “so the interior should be equally grand.” A television is contained in a black box at the foot of the bamboo canopy bed and rises up on a platform that can be swung around, so the homeowners can watch while in bed or while sitting in a chair. In the adjacent bathroom, a soaking tub with nickel-finished legs sits atop a floor of honed mosaic marble and below an octagonal dome inlaid with wood and featuring a star-shaped pendant light. To build, the homeowners knocked down a previous home. While insulating the new house, the couple put the obituary of the previous owner in the wall, facing Bumpkin Island. The wife also decided to honor the previous home by asking Lord to save the home’s barometers. “I sent them to Cape Cod to be restored and mounted, then gave them to my husband for Christmas,” she says. Outside, landscape designer Ted Carter of Buxton wanted “something formal, rather estate-like” to suit the house. White entry gates open on a grass auto court, and European hornbeam hedges screen the property. The homeowners have formal rose, cutting, and vegetable gardens. At the back of the house, Carter has used design elements, including a pool, to produce a ha-ha: a landscape feature that distinguishes the crisp, clean edge of a finished landscape from the natural landscape beyond and has the effect of drawing the gaze from the foreground to the background—in this case, the ocean view. In the process of building the house—when the basic design had been established but the finishes and detail-work weren’t—the various players realized that the homeowners knew what they wanted but were having trouble articulating it. At that point, Catalfano was brought in on the project. As he and the wife were talking, Catalfano said, “I am going to show you just what you want.” He opened Russell Versaci’s Creating a New Old House, a book that had inspired his own home in Kennebunk. It turned out that the wife had looked at that very book earlier, when she was trying to imagine her house. The picture Catalfano opened to was just what she was trying to visualize: a stately, gambrel-roofed, shingle-style estate, almost an exact duplicate of the home she and her husband now call their own.